4.5" x 5.1" stitched on 14 count. 3.5" x 3.9" stitched on 18 count. 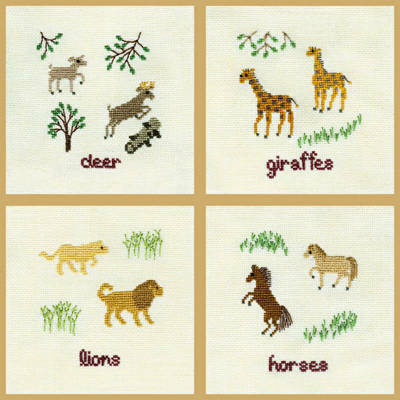 Two by Two They Came - Group 1 cross stitch pattern... FOUR cross-stitch designs stitched with pearl cotton show pairs of animals traveling to the ark to make a Two by Two They Came afghan. Pillow making instructions included. Glass beads are used for the eyes. More installments to series.